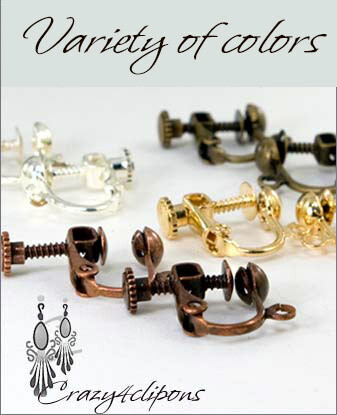 Features:These clip findings feature a slightly smaller size and they are great to make or convert smaller clip on earrings. 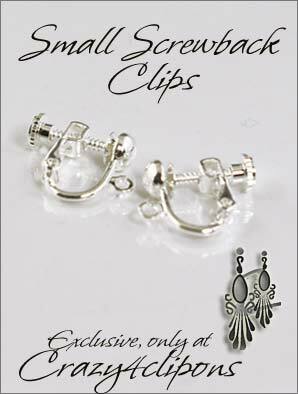 While the size is a bit smaller, these clips still have enough space to open and hug the earlobes. 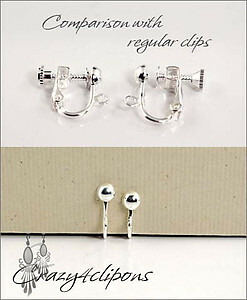 They benefit from screw back mechanism from our popular regular sized clip on screw back earring findings. Screw back clip findings are great. They give you control to tighten the tension of the backs perfectly to your ears. All is needed is the adjustment of the screws until the earrings are secured and comfortable on the earlobes, then just open/close the hinge to put them on and take them off without having to re-adjust the screws parts. Clip findings and parts from Crazy4clipons.com are NOT to be used to make products for children under 13 years of age.